Bleak Bliss: Zenith - All That Remains: The Surviving Records Of "VCR Static Death"
Zenith - All That Remains: The Surviving Records Of "VCR Static Death"
Zenith, (based on the electronics brand of the same name) is a Wisconsin based HNW project. The project has been on hold for about two years now and the final release is still up in the air. 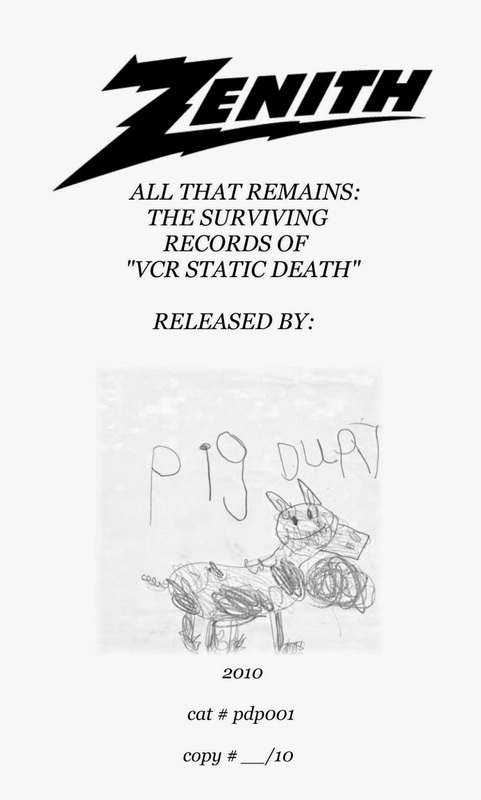 All That Remains compiles the first forays into 'VCRHNW,' noise walls made by capturing static from a VCR (the Zenith 4110) on different tape recorders and fed through a TV to manipulate volume levels and create different types of wall noise. This was released by the great and sadly defunct PigDurt Productions in 2010 in an edition of ten. Two C60s and a C40 full of noise walls. Zenith also recorded as FAP and My Lovely Figment. He was also responsible for the excellent Dictafawn microcassette label. Although the label no longer releases, the entire catlogue is available for free download on it's Bandcamp page. Zenith went on to release a CDr on Slow Death Records in 2011 (available for free here) and, speaking of Dictafawn, a solo microcassette the same year. This was the second "official" thing related to Zenith in-between the boxset & Chain. Not a lot of discussion on this one, probably because only 10 people could feasibly own it, and while it's not technically a DF release it's a fitting predecessor. I was going to post the JS split with the next set of wall...great to see it sitting on the Dictafawn site! Yeah, sorry to be impatient, but after some thought I figured it'd be appropriate given the format.